I have been living a life of ignorance apparently, because I just learned today that there’s more than one type of ladybug. Also they’re actually called ladybirds, for whatever that’s worth. The one we’re probably most familiar with in the states is called the seven spot ladybird (or Coccinella septempunctata for the lay person). It’s just a standard little beetle and both the larval and adult forms luuurve to chow down on aphids. For this reason, they’re often used to help to control aphid populations on crops. Plus they’re kind of cute when they grow up. Fun fact – they’re also the official state insect for New Hampshire, Massachusetts, Pennsylvania, Delaware, Ohio, and Tennessee. So, you know, I’m sure that information will be valuable to you at some point in your future. Anyway, there’s apparently ANOTHER type of ladybird that is native to Asia that’s been coming over here and really messing things up for our dear old seven-spotted friend. It’s called the harlequin ladybird and it’s particularly annoying because it harbors a dangerous parasite in it’s blood… yet it’s not vulnerable to this particular invader. So when this ladybug is introduced into North American insect populations, it lays it’s nasty little parasite filled eggs and other insects eat them and become infected and die. 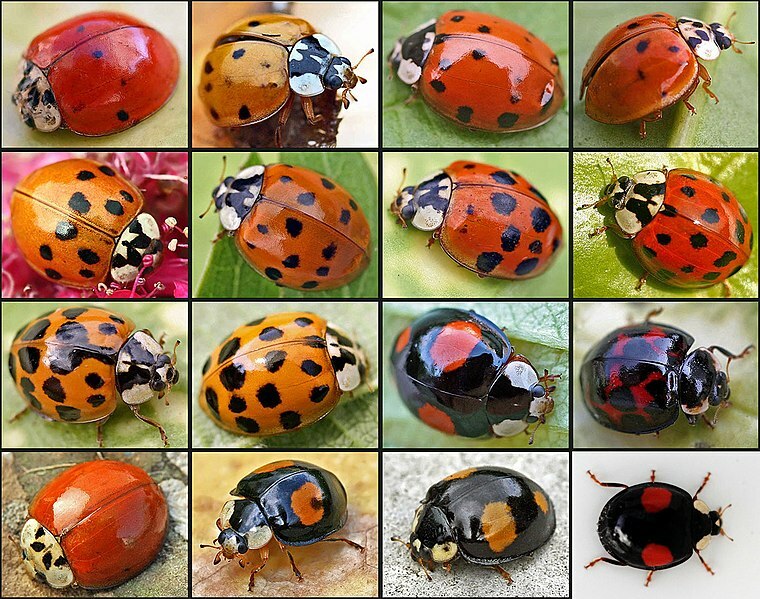 They look pretty much just like normal ladybugs except they can have lot’s of different patterns, not just the standard 7-spot model. The parasite is called microsporidia, which are single celled fungal jerks that are wiping out the insect populations wherever they’re introduced. It’s been hypothesized that similar microsporidian parasites might be contributing to the decline in honeybee populations, but not yet confirmed. Take home message – we have to stop trying to introduce non-native species to control native species (like aphids). It has pretty much never worked out well for us, and we end up screwing up the ecosystem and food chain and life in general for all kinds of native species that were just minding their own business before we showed up and tried to “fix” things. Ha just kidding. But no, seriously, kill the little jerk. Excellent research, corroborated by my own from a couple years ago when I was having an aphid infestation throughout my indoor houseplant collection and outdoor garden. An interesting thing to note, as well, is that while I’ve never heard of anyone being bitten by a native ladybug, one of my exes freaked out when she was bitten (with the mark to prove it) by one of the Asian interlopers. Not so cute anymore, huh?